Andy is a valuable member of the Community Ambulance, Macon division team. Andy is an active member of the Community Ambulance Disaster Response Team, which in October of 2016, was called on to participate in a statewide effort to aid with patient evacuations surrounding Hurricane Matthew. As part of this deployment, Andy participated in what ultimately became the largest coastal evacuation in state history. In addition to his full time role as a Paramedic, Andy also serves as a Preceptor and Field Training Officer. Through these roles, Andy is able to share his knowledge, skill and passion for patient care with those who are new to EMS or our organization. As an educator and mentor, Andy has played a vital role in helping with training efforts within the organization, through National Registry skills testing and annual skills assessments for associates. As a clinician, Andy demonstrates a high level of compassion and professionalism while taking care of the patients he serves. Andy is able to build a trusting rapport with his patients, taking the time to connect with each patient, put them at ease and provide a high level of care. Andy is able to maintain a calm composure in the field, even during the most stressful situations. Andy is knowledgeable of clinical protocols and works within them to provide the best possible care to his patients. 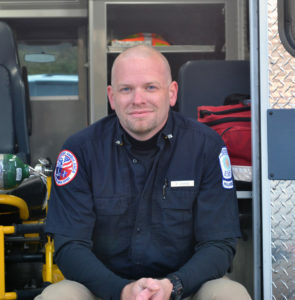 A true EMS professional, Andy is dependable, punctual and has a strong work ethic. As an incredibly reliable associate, Andy readily and enthusiastically takes on new tasks and challenges. Though incredible knowledgeable and skillful, Andy demonstrates humility and honesty with his patients as well as his peers. Andy Jenkins is, without a doubt, a true “star” in the field of EMS.